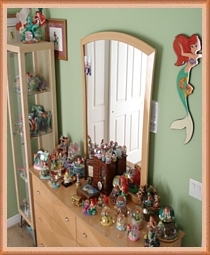 Our collection consists of snowglobes, figurines, crytals items, photo frames, lamps, mugs, pins, plates, trinkets boxes, music boxes, watch, high-end figurines, displays, and animation art among others. If we had to choose our favorite items, the snowglobes would be one of the most favorite items in our collection. There is just something magical about the music and glitter floating around! Part of the collection was purchased on Ebay, especially the older and hard to find collector items. The other parts of the collection were purchased from WDW, DL, The Disney Store, DisneyShopping.com, and other random stores. The following pictures will direct you to the main page of each category. Some of the items may contain more than one picture and you can see them by moving the cursor over the picture. I'll try to add new items regularly and I'll announce them on the updates section.